Diabetes diet: what should I eat if I have type 2 diabetes? What can I eat if I have type 2 diabetes mellitus? Is there a diabetes friendly diet? If you are someone who has diabetes, you may think that you should be following a special Diabetic Diet. If you have diabetes, it doesn’t mean that you have to buy all these special foods. A healthy diet for people with diabetes is very much the same as a healthy diet for people without diabetes! This includes choosing foods that are high in fibre, a variety of lower carbohydrate containing fruits and vegetables, choosing lean cuts of meat, and reducing your intake of foods that are high in sugar, salt, and fat. This can be done by limiting the amount of processed food you consume. Below are some healthy food choices you can make if you have diabetes. It is also important that you spread your carbohydrates evenly throughout the day. If you do, it will ensure that your body is getting a steady supply of energy. Your doctor may have already recommended how many portions of carbohydrates you should have throughout the day. If this is the case, knowing your allowable carb portions each day can help you to spread evenly across the day. By doing so, you reduce the chance of your blood glucose levels going too low or too high. To learn more about carbohydrates, read Carbohydrates and Diabetes or read how to reduce carbs in your diet if you need some easy and helpful tips. These days, people are eating bigger and bigger portion sizes. Coupled with a more sedentary lifestyle, it’s no wonder that obesity and other lifestyle related conditions are on the rise. The study Portion Control Plate for Weight Loss in Obese Patients With Type 2 Diabetes Mellitus has found that reducing the size of your meals has positive effects with blood glucose levels as well as assists in weight loss! Firstly let me be clear….all fats contain the same amount of calories so if you are after weight loss then swapping one type of fat for another makes little difference. Changing from butter to margarine won’t make you lose weight but it will help greatly in other ways. If you have diabetes you are at an increased risk of heart disease. Often people with diabetes also have high blood triglyceride levels, high blood pressure, and have clotting and circulation problems. These all explain why type 2 diabetes is associated with higher rates of heart attacks and strokes than the non diabetic population. Saturated fats are considered ‘bad’ fats and cause your ‘bad’ cholesterol to rise. This bad cholesterol is called low-density lipoprotein cholesterol or LDL cholesterol for short. LDL cholesterol is associated with heart disease. It can even contribute to the build-up of fatty deposits in your artery walls. This build up can disrupt how well your blood is able to flow because it narrows the space that the blood can flow through. The narrowing of your arteries can place additional pressure on your heart, making it work harder. Saturated fat can be found in both animal foods and some vegetable fats. Animal products like fatty meat and dairy (milk, butter, cheese) all contain saturated fats. Now, don’t go thinking that all veggies are bad. That is certainly not the case! But as mentioned, there are some vegetable fats that are high in saturated fats. Coconut is an example of this and is 90% saturated fats. Compare this to olive oil which is 15% saturated fat. Coconut products that contain a lot of saturated fats include coconut oil, milk, and cream. If you reduce your intake of saturated fats in an effort to reduce your risk of heart disease, your heart will thank you! We still need some fat in our diets, as fat has a crucial role in our body. So not only is the amount of fat that we consume important, so is the type of fat (Prevention and Management of Type 2 Diabetes: Dietary Components and Nutritional Strategies). You may have heard of the term ‘healthy fats.’ These healthy fats are monounsaturated and polyunsaturated fats. Unsaturated fats are able to assist in reducing your LDL cholesterol, with polyunsaturated fats able to do the job more effectively than monounsaturated fats. Eating small amounts of mono- and polyunsaturated fats can help to ensure that our bodies are able to get the essential fatty acids and vitamins that it needs. In cooking, you can substitute saturated fats for healthier fats such as using olive oil or grape seed oil instead of butter. Fibre is a type of carbohydrate and can be divided into two categories: soluble and insoluble fibre. Soluble fibre is more important for diabetes management (High saturated-fat and low-fibre intake: a comparative analysis of nutrient intake in individuals with and without type 2 diabetes). Soluble fibre partially dissolves in water when it’s in the digestive tract, slowing the rate at which food is absorbed into the blood stream. This can cause blood glucose levels to rise more gradually and reduce the demand for insulin. Insoluble fibre does not dissolve in water and instead passes through the digestive tract. It’s important as it helps to provide bulk to our stools which can help to avoid constipation. Drinking alcohol is common, especially when we are at a social engagement. If you are someone that drinks alcohol, you may need to limit your intake. If you are trying to lose weight, your alcohol consumption may be getting in the way of your efforts. Alcohol offers little nutritional benefit and can also be high in energy! Also, alcohol is damaging to our bodies, for example our brain, liver, and pancreas. Excessive alcohol consumption is associated with an increased risk of certain types of cancers, including breast, colon, oral, and stomach cancers. We should all limit our alcohol consumption to no more than two drinks per day. You might not realise that consuming four or more alcoholic beverages in a single occasion is actually considered binge drinking! Having too much visceral fat (Visceral Fat Mass Has Stronger Associations with Diabetes and Prediabetes than Other Anthropometric Obesity Indicators among Korean Adults, Dysfunctional Adiposity and the Risk of Prediabetes and Type 2 Diabetes in Obese Adults), a type of fat that’s stored around our internal organs is associated with an increased risk of developing other health conditions, not just type 2 diabetes! This includes heart disease, heart attacks, stroke, and bowel cancer. It is recommended that you lose your excess weight. Even if you lose a small amount of weight, it can help to improve your blood glucose levels. One thing to be mindful of is if you lose weight, it is important not to regain it. If you are obese or overweight and have lost weight, you may have noticed how your blood glucose levels and insulin levels have decreased. Well done! The problem is that if you regain some of or all of the weight you initially lost, your blood glucose and insulin levels can rise again, putting you back at risk of developing diabetes. You can check your BMI (body mass index) using the BMI tool below. If you want more information about why your BMI is important, you can learn more from the BMI Calculator page. Yes, this may all seem complicated and like you have to remember a million little things. Over time, you will be able to get the hang of everything and be a pro at managing your diabetes, it will just take a little bit of planning and understanding at the start. Also, you have control over your diet. Don’t view your diabetes as a death sentence, instead use it as a motivator to lead a healthier lifestyle and avoid any complications for the future. It really goes to show how a few simple changes can make such a positive impact on your health and your quality of life in the future. 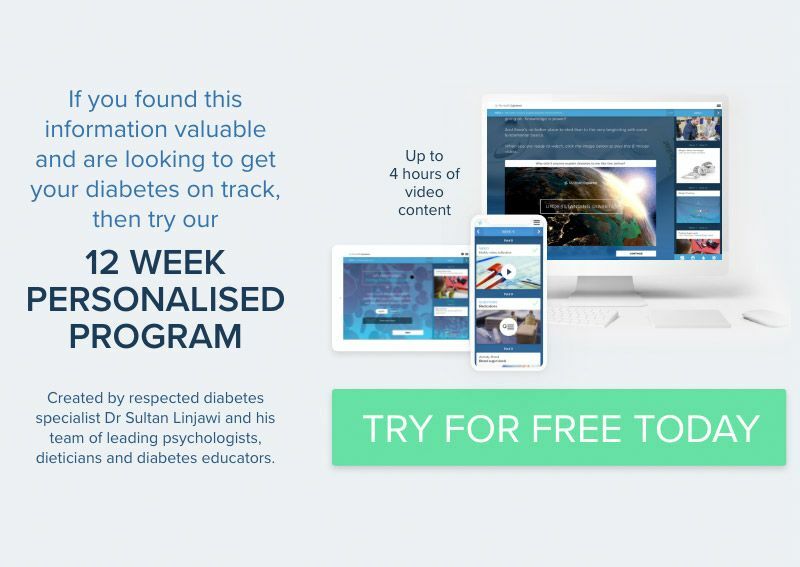 If you would like to be a part of a supportive program, with easy to understand video content covering all aspects of diabetes, join our personalised 12 week diabetes program. The program is personalised, giving you more of the content that you want to see. When you sign up, you receive the first week free!